Hi, my name is Sunjeet. 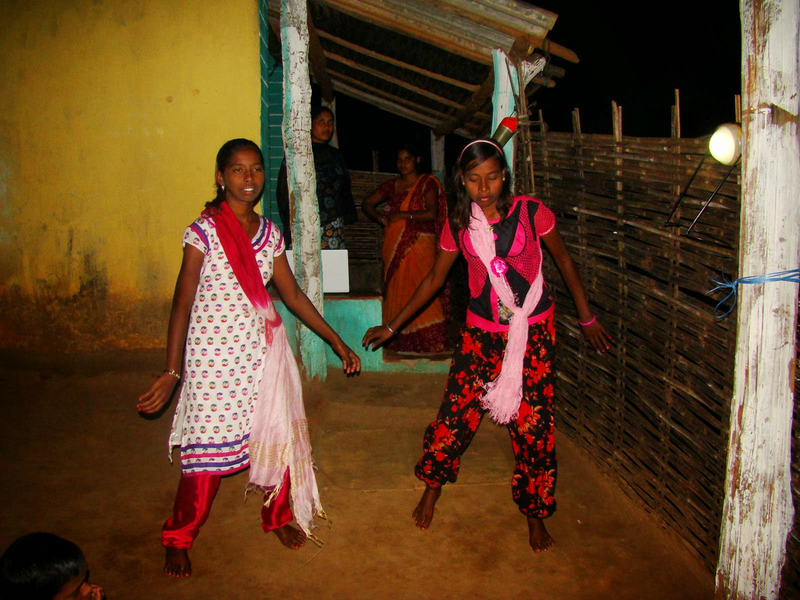 I am a team member of Kids-R-ok and I just wanted to share my experience of visiting our first project in Orissa. 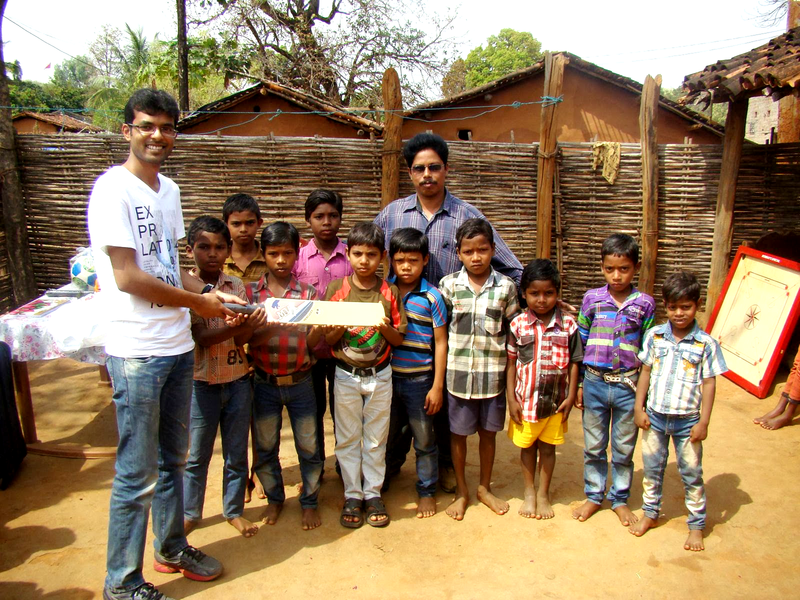 This was the first official trip for any Kids-R-ok member to visit our main project which is a Children’s home for underprivileged children in Urladani Village in the Kalahandi district of Orissa. I made this trip along with Roy Robinson who is a volunteer and a well wisher of Kids-R-ok, as well as a very close childhood friend of Allan (founder of Kids-R-ok) and mine. The two of us were to meet at Vizag, Andhra Pradesh and drive together from there to the Children’s home. We were both excited as well as nervous as to what to expect. I had reached Vizag a couple of days earlier than Roy to spend time with my family as it is my native place. On the morning of our travel, I loaded up our sturdy SUV with some clothes for the kids which were given to me by some of our generous donors from the US and some sporting goods for the kids as well. I took along a road map of Orissa as I had been warned that we would not have cell phone signals or internet on my phone to look at directions. (All of the warnings were true). 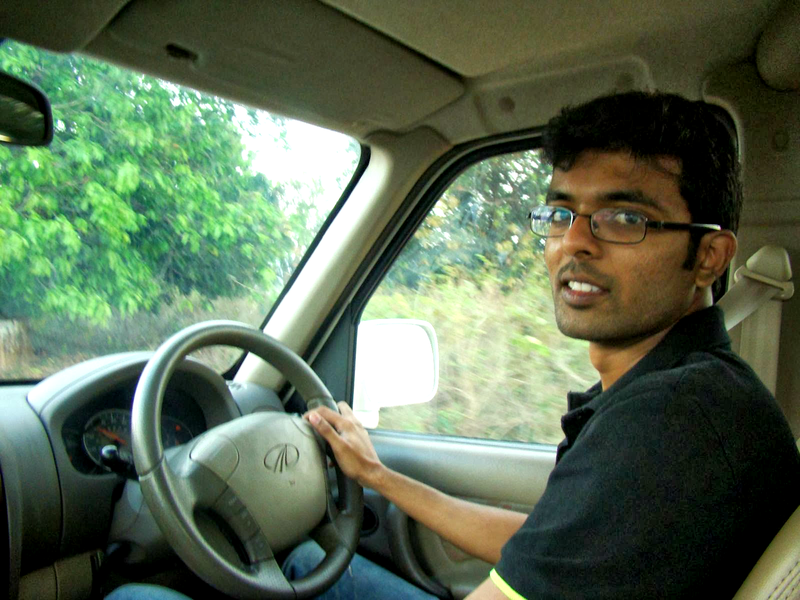 I reached the Vizag airport at 8:45am, picked up Roy and by 9am we were on our way. Google maps said the 360 km (220 mile) drive should take us 5.5 hours. We figured with the bad roads of Orissa, it should take us 7-8 hours. ( We were wrong, it took us 9.5 hours!!) . In three hours time we swiftly reached the Orissa state border from Andhra Pradesh. 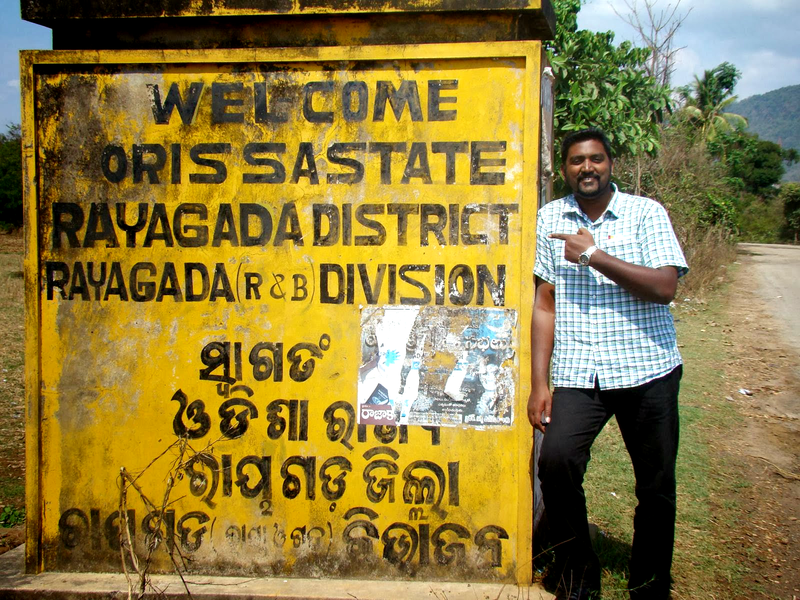 Roy and me were excited as we stopped by and took pictures at the ‘Welcome to Orissa sign’ . 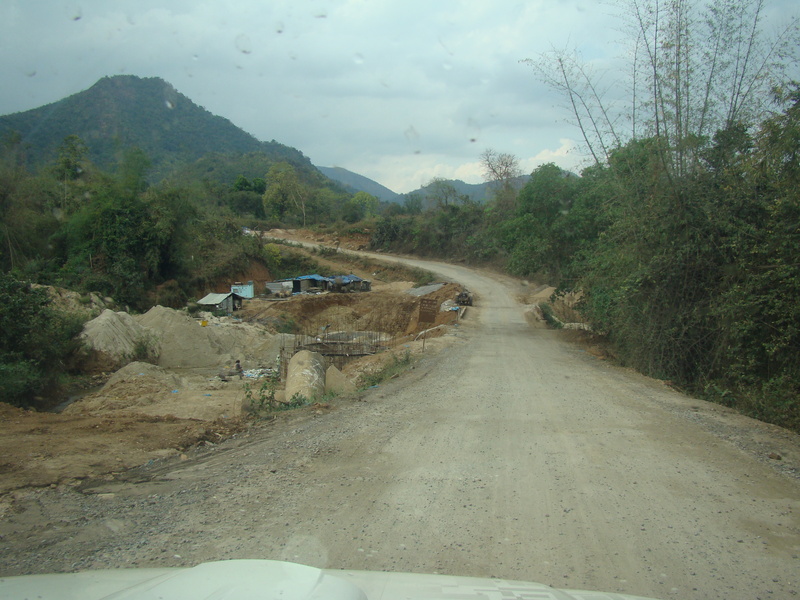 Our excitement was short lived as almost instantaneously the smooth road turned into a narrow broken road where it was possible to average speeds of only about 20 to 30 km/hr in some parts (i.e 15 to 18 mile/hour). 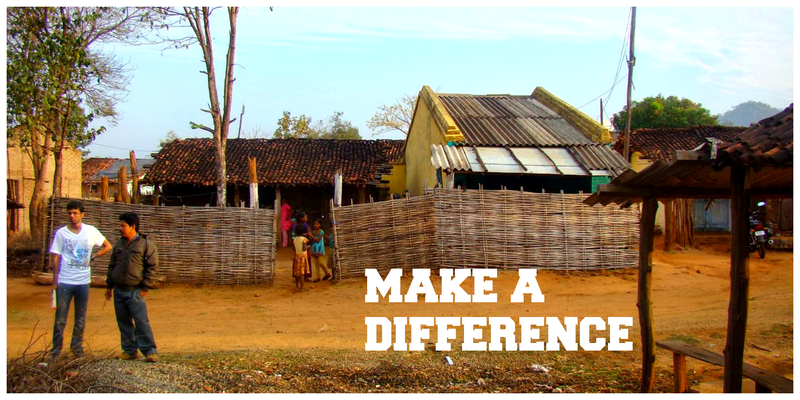 Kalahandi district where the children’s home is located is one of the most backward districts in Orissa, consisting of forests and tribal areas. Cell phone signal was very spotty and non existent is some areas. As we did not have cell phone signals, we were not able to communicate with our contact person, Brother S.K Nayak while traveling. We had told him earlier that we would arrive around 4 pm, but as we entered this small remote village it was about 6:30 pm. He was waiting for us by the main road. We quickly exchanged greetings and he got into our vehicle and we drove to the children’s home. We welcome you, you are our guest, but we know it is God who has sent you to us. We were touched by the beautiful meaning of this song. Immediately after the song was over each one of the kids came and gave Roy and me a home-built bouquet of 4 or 5 flowers and touched our feet for our blessings. Within minutes Roy and myself were trying to juggle around 30 of these bouquets each, while still wearing the shawl and the garland (Not as easy as you think. lol) Within moments, we felt that our back aching, bone jolting journey through those horrible roads to come see these children was totally worth it and was very selfish of us to even complain about it. We were then made to sit at a table in front of all the kids as they sat on the ground facing us. 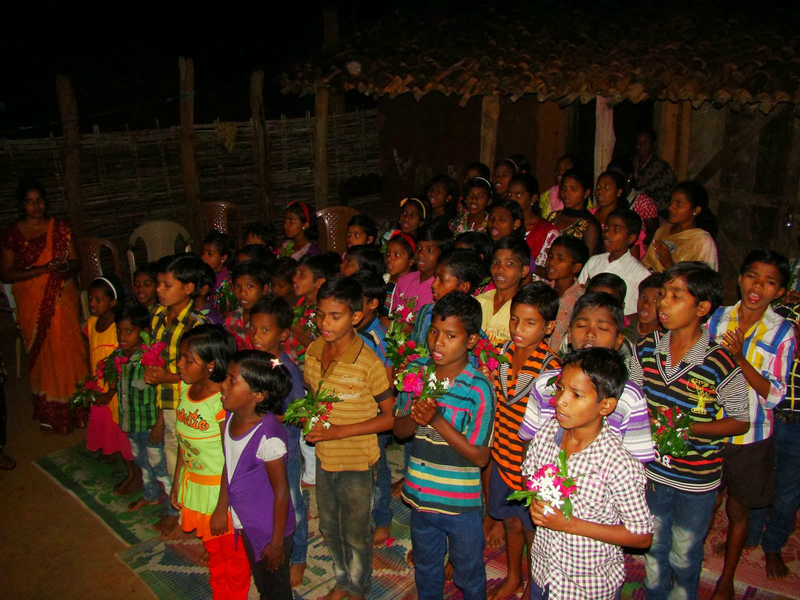 We were served refreshments and the kids entertained us by singing a few more songs. The children then all stood up and prayed for us, that God might bless us abundantly and protect us. (Yea that’s not a typo, They prayed for us not we praying for them). We were overwhelmed and humbled and at a complete lack of words. Later a couple of girls performed a dance for us. We spent sometime talking and interacting with few of the kids and getting to know them a little. It was late in the night and the only hotel that Brother Nayak was able to book for us was another hour and a half drive through the forest in a slightly bigger town about 60 km away (Yep, no online booking here). By the time we reached our dingy hotel it was 11:30 pm. We ate some food that we had quickly picked up on the way and went to sleep. Our plan for the next day morning was to get up around 4:30 am and leave to the Children’s home again. Even though I was super tired from the previous day, I woke up without an alarm by 3:30 am and couldn’t fall back to sleep. I was excited to go visit the children’s home in daylight and survey the infrastructure and give the kids the gifts and do many things we had planned out. As I lay on my bed, my excited Kids-R-ok team members from Sweden and the US were texting me and advising me/asking me several things. They were as excited as we were. By 6:40 am on Saturday morning we had reached the children’s home. All the children were already up and about and flashing us smiles as we entered. We met Brother S K Naik and after having a cup of nice hot cardamom tea, we set off to survey the infrastructure of the children’s home and the schools they attend. All the 60 children attend Oriya medium schools with English just being taught as a second language. Our first stop was a private high school. Here grades 8th, 9th and 10th are taught. Four of the children from our children’s home attend this school. There are a total of 120 children who attend this school. 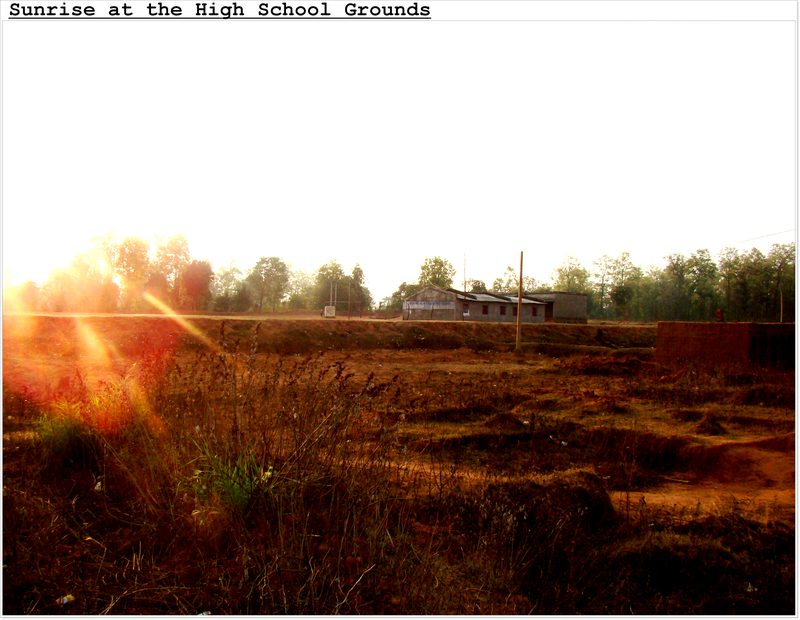 This school is the only high school in all the surrounding 44 villages. Without the initiative and persistence of Brother S K Nayak and a few others from the village, this school would have just remained a dream and all children would have had to stop their education with grade 7. The building is bare and small to say the least, but atleast it is a step in the right direction. 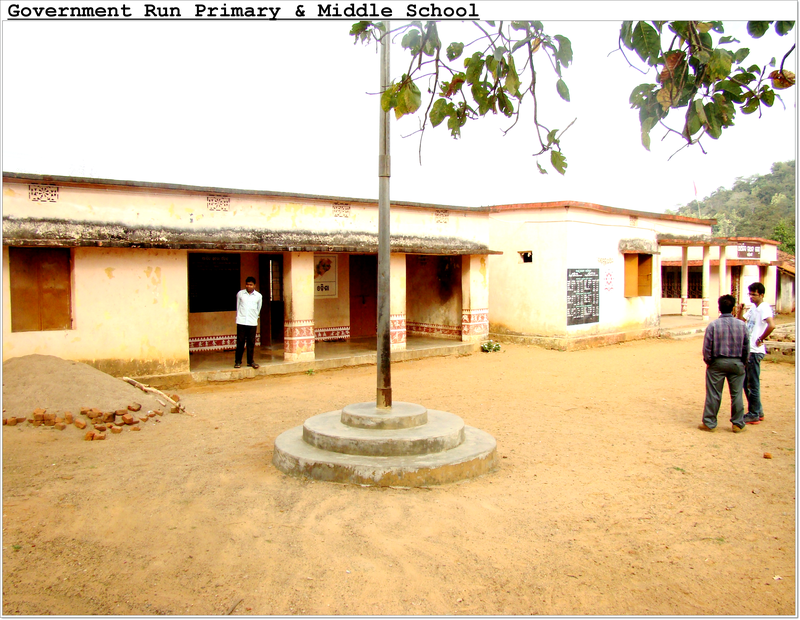 Next we went to have a look at the government run primary and middle school where most of our children attend school. This school houses grades 1st to 7th. We had a chance to meet the assistant head master and have a conversation with him. He along with another teacher, teach all the 7 grades. (Don’t ask me how that’s possible, because I have no clue either!!). By the time we were wrapping up our conversation with the assistant head master, another gentleman approached us. Brother Nayak told us that he was very eager to meet us and would like to talk to us. This person explained to us that he, along with some other villagers have very recently started a English medium school and he wanted us to come visit it a few blocks up the road. We followed him as he showed us the land which they have acquired and propose to construct the buildings. Right now this school caters to only Lower Kindergarten, Upper Kindergarten and 1st grade. Currently there is only one shed/room where all the classes are conducted. They would like to eventually build some kind of infrastructure and extend the grades as well. 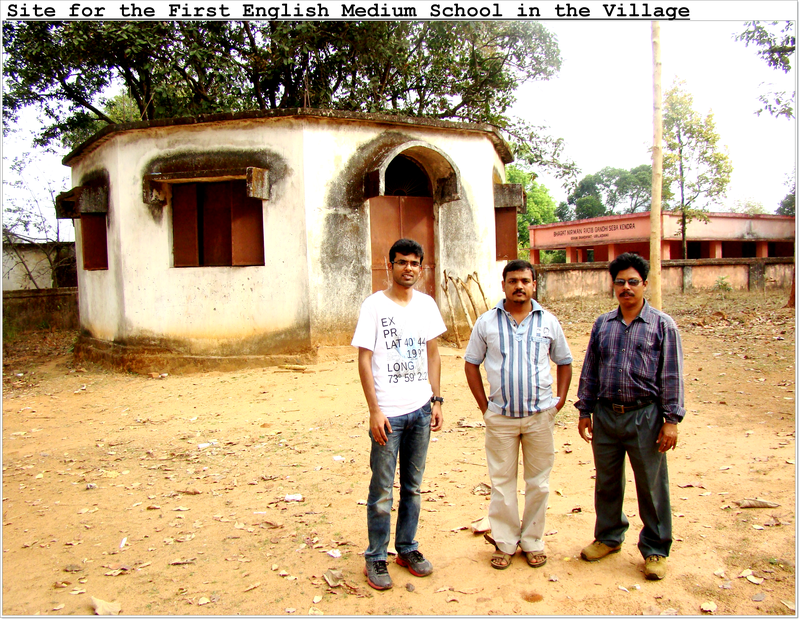 This is the first and only English medium school in Urladani village. None of our children attend this school currently. It was very encouraging to see such an initiative happening in this village and the enthusiasm on this man’s face. We proceeded back to the children’s home and spent sometime talking to all the children (of course through our interpreter Brother Nayak, although I’m proud to say I can speak 2 or 3 of sentences in Oriya. Not bad for a day’s work huh? :)..). We then distributed the clothes to the children that were donated by our wonderful donors . 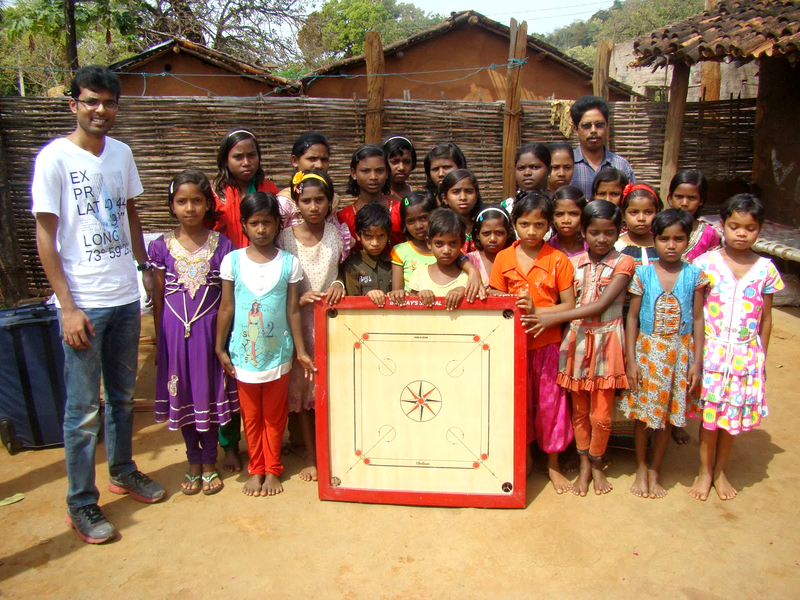 They were also super excited to receive the cricket bats, footballs, skipping ropes, frisbees and a carrom board that we had brought for them. The kids were thrilled to go play with their new equipment and Roy, myself along with Brother Nayak set out to survey the house itself where the children live. We had a rough idea of what to expect, but still we were taken aback (shocked might be a better word) by what we saw. The house consists of 2 tiny rooms in the front, after which is a slightly larger room (probably 12 feet by 15 feet). This room is where almost about 24 kids (usually the girls or the little ones) sleep in the night on a mat or a thin bed-sheet laid out on the ground. A slightly smaller room next to this accommodates another 15 kids or so. Attached to this main building is another make-shift building with two small rooms with mud walls that are almost about to collapse, a roof that leaks when it rains and broken flooring where it is not uncommon to see rats. Brother Nayak’s and our dream is to demolish this makeshift building (4 strong men giving it a good hard push should do as well) and build a dorm for the girls and the boys to get a peaceful and safe night’s sleep. Only time will tell if this dream will just remain a dream or will actually be realized. Only time will tell if this dream will just remain a dream or will actually be realized. There was only one super tiny toilet in the whole building and I turned to brother Nayak and asked him where do all the children take a bath and use the toilet. We headed on a walk from the backyard of the home. About 5 mins into our walk brother Nayak pointed out to some bushes and scrubs and told us that this is where the children go to the toilet. We were also told that apart from the distance and the lack of hygiene, it is very unsafe with creatures like scorpions and snakes especially in the nights. Another 5 minute walk from here through the rough terrain, we reached a dirty river. This is where the children have a bath everyday. During the rainy season we were told that the river swells up and it become unsafe to go there. We took a deep breath and headed back to the children’s home where we had to do some routine paper work and verification on various documents and accounts. We were served a yummy meal after that. The day’s special was chicken curry. Right now they can afford to serve the children any non veg only once a month and they made that special day, the day we were there. 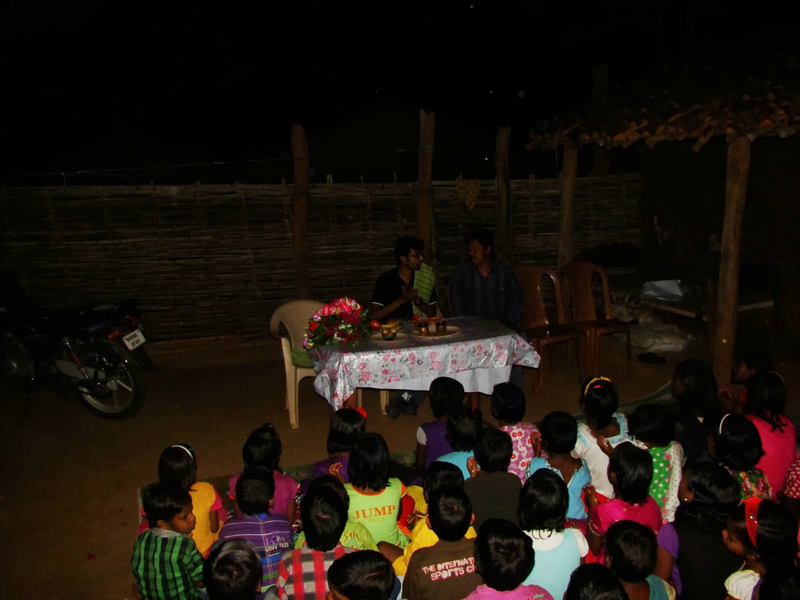 The children have an egg once a week and the rest of the days they are served some kind of daal (lentil) with rice. All meals are prepared on the premise by an amma (motherly figure). It was time to head back home as we had a long journey back and we wanted to try our best to get out of the secluded and bad roads that laid ahead of us, before night fall. We said our goodbyes to the children and the staff, and got into our snobbish, air-conditioned, leather seated SUV (atleast that’s what it felt like after seeing the condition in which these children lived). A brief moment of silence between Roy and myself as we started to drive away. The thoughts in my head were, how do these children look so happy and content? 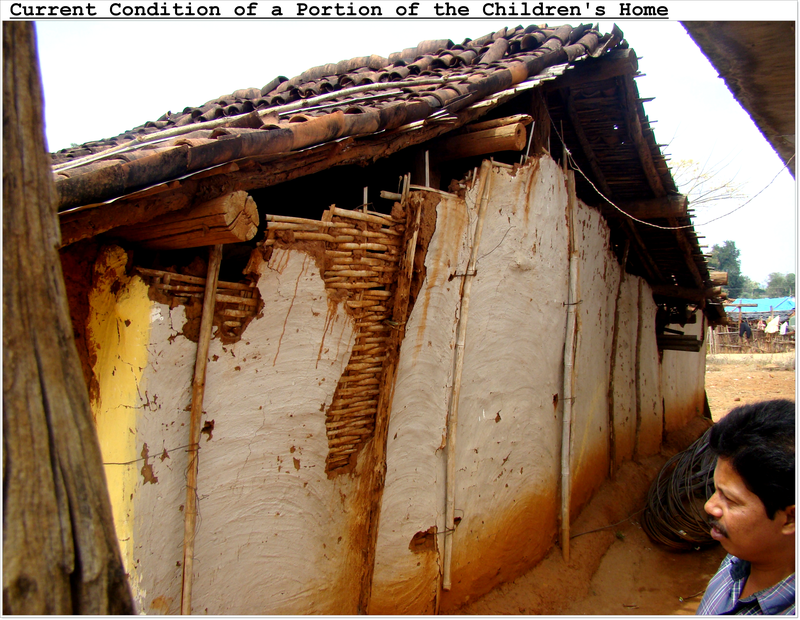 Would we be able to bring some substantial change to the condition in which these children live? Would some of these children who told me they wanted to become doctors, teachers and nurses actually realize their dreams? Later when I broke the silence and told Roy this, he said his thoughts and doubts were similar to mine. This entry was posted in Visit and tagged Aid, Asia, Charity, Chennai, Children, Education, food, Gifts, Home, India, infrastructure, Kalahandhi District, Letter, Linköping, New York, Organization, Orissa, Orphanage, Project, Rural India, Sweden, Travel, urladani village, USA, Vizag, water. Bookmark the permalink. 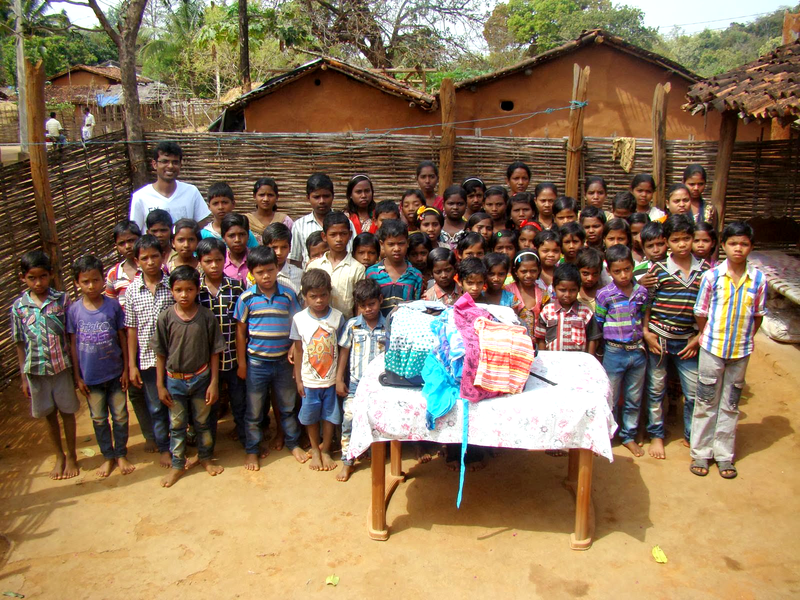 I’m really glad you took the initiative to go all the way to Orissa to see all these kids and give them the gifts! I’m sure they’ve been blessed by it and may God bless you and Roy too for all your efforts!